As Liverpool band Paris Youth Foundation prepare to release their debut EP, front man Kevin Potter spoke to Getintothis’ Amos Wynn at their recent Phase One show. There is a lot for Paris Youth Foundation to be excited about, with things getting bigger and better for the five-piece. The Nights Are For Thinking of You, which is due for release soon, was produced by Rich Turvey who has previously worked with the likes of Blossoms and Clean Cut Kid. Potter hopes that the new crop of tracks has taken a step up from their previous releases. The song writing process for the band begins in Potter’s bedroom before taking it to rest of the five-piece, comprising of Jamie Hives (guitar), Tom Morris Jones (guitar), Paul Bates (bass) and Jonny Alderton (drums). 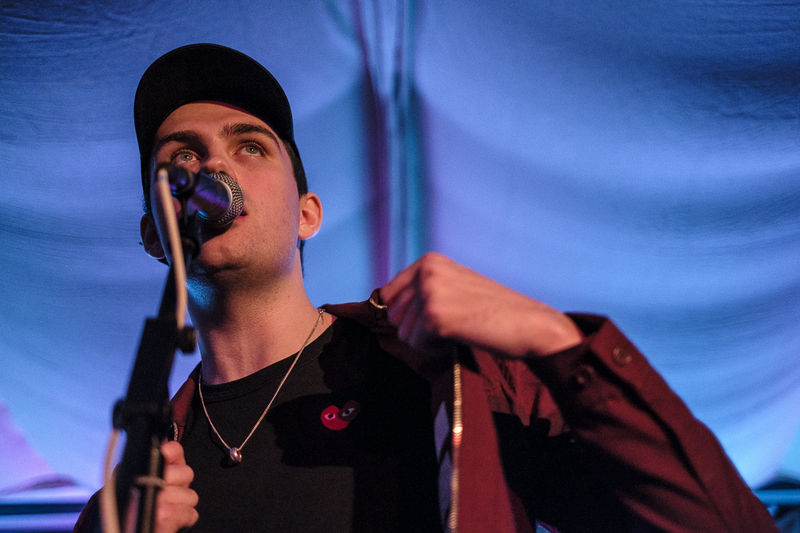 The bands current tour will now see them supporting both The Xcerts and Vistas in venues up and down the country, leaving Potter feeling ‘excited’ at the prospect of being on the road. “When you’ve been stuck in the studio or the band room with these idiots for a few months (I sound like a football player) it’s nice to get back out playing,” he jokes. There current run of shows includes a return to Liverpool Sound City, where they made a triumphant appearance on the main stage last May. That wasn’t the only big milestone the band achieved in 2018, as they also got the opportunity to perform at the O2 Academy supporting the Sherlocks in October. Following their current dates of shows Potter hopes the band will head back into Parr Street Studios with the aim of getting another single out during the summer. With a breath-taking hometown gig under their belts and an exciting EP on the horizon, there is plenty going for Paris Youth Foundation.